Blog Home / Quilting Blog / Getting an Accurate ¼” Seam Allowance: Easier Said Than Done? 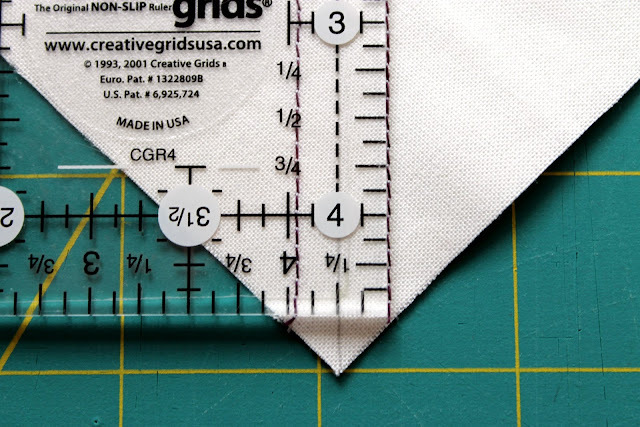 Getting an Accurate ¼” Seam Allowance: Easier Said Than Done? It seems simple enough when you read the quilting pattern: Use a ¼” seam allowance. Start stitching your pieces and blocks, and you’ll be on your way, right? First of all, it is important to know why quilters use a ¼” seam allowance. Since many quilt patterns require the joining of multiple pieces it is important to reduce unnecessary bulk on the back of the quilt. By using a ¼” seam allowance you will have the least amount of bulk possible, which will also make quilting easier. It might help if you think of a quilt like a puzzle. All the pieces of a puzzle must fit in the right location, or the rest of the puzzle won’t work. The same rule applies for quilting. There are a variety of ways to ensure that your seam allowance is as precise as possible. The most basic elements to check before you start stitching are your presser foot and your thread. Measure your presser foot alignment with a ruler to make sure that it is, indeed, an accurate ¼” foot. Place the ruler under your presser foot so that the ¼” marking extends to the right. Hand wheel your needle down on the ruler, then lower your presser foot. If the edge of the presser foot matches the ¼” marking on the ruler then you have an accurate ¼”. If not you can place a piece of masking tape, moleskin, Machine Seam Gauge, or mark with a permanent pen, to identify the true ¼” marking. The thread you choose for piecing is just as important as the presser foot. We prefer Aurifil thread for piecing. Aurifil is a strong but thin thread, which helps to keep the bulk down. Thicker threads will add bulk to your seam allowance, which can contribute to pieces/blocks not fitting together precisely. It is important to read patterns carefully, to see how they are directing you to complete your piecing. When figuring seam allowances mathematically it’s easy to figure out the size of pieces/finished blocks/etc. But when it comes to stitching the pieces together, you might need to make some compensation to keep your accuracy precise. A pattern might instruct you to use a “scant” ¼” seam allowance. This means that you should use a ¼”, less one or two threads of the fabric. In other words you’ll create a seam allowance that is a smidge less than a true ¼”. If you’re looking for extra assurance that you are on the right track there are some wonderful tools on the market that will help you create accurate seam allowances. Quilter’s Machine Seam Gauge from Prym-Dritz is a great tool that looks like a red ruler with adhesive foam on the back. Simply place this tool on the throat plate of your machine in the ¼” position. Since this tool has an “edge” to it, it’s easy to guide your fabrics right along side of it. The foam is repositionable and doesn’t leave a sticky residue. Hopefully these tips will assist you in creating precise and accurate ¼” seam allowances. This is such an important element in quilt making, but is so easy to do inaccurately. What tips can you share that lead to great success in creating precise and beautiful quilts?